Any area of your home that’s wet and damp can be the ideal breeding ground for a number of unpleasant pathogens, such as bacteria, mildew and the dreaded mold. Mold tends to hang on – even after you’ve taken measures to remedy your Rome, NY home’s dampness problems. By choosing to work with Basement Waterproofing, Inc., however, you can rest assured that your wetness problem will be addressed and remedied. Additionally, you’ll get the mold removal you need for the health and safety of your family. 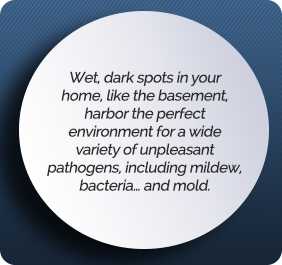 Choose BWI for the mold removal you need for your Rome, NY home. BWI proudly offers mold removal in your Rome, NY home for the health and safety of your family. Nobody should have to live with mold issues in their home. When you need mold removal for your Rome, NY home, let BWI talk to you about our SEC anti-mold spray. For your convenience, we’re fully staffed during normal working hours to answer your calls – call our Rome, NY office with any questions you may have at (315) 336-4951 or toll-free at (800) 439-4951, and we’ll be glad to help.